A by-election will be held in Chadsmead ward on 30/Jan/2014. This follows the disqualification of Mike Friars ( Conservative ) for failing to attend any District Council meetings for six consecutive months. The candidates are listed in the table below. The official candidate list is available on Lichfield District Council's website. In the 2011 election Mike Fryers ( Conservative ) and Terry Thomas ( Conservative ) were elected to represent Chadsmead. UPDATE 18/Dec/2013: South Staffs Water Co. tweeted to say that the repair is to be completed in January. Joint inspection expected 16-20/Dec/2013 – Both South Staffs Water Co. & Staffs County Highways to be involved. The road surface outside Ego restaurant, corner of Beacon Street and Swan Road, has been collapsing for six months to a year. See images to the right: the top photo was taken on 04/Nov/2013; while the bottom photo, taken on 11/Dec/2013, shows some very rudimentary repairs. If the collapse is due to the water pipes then the South Staffs Water Co. are responsible, otherwise its down to Staffs County Highways. If it is considered a safety issue then County Highways must ensure that a temporary repair is made. A blow by blow account of BSARA's discussions with County Highways and with South Staffs Water Co. can be seen on BSARA's FixMyStreet #Storify time-line. 17/Oct/2013 – Staffs County Highways say "drain issue" reported to S Stafs Water. Really? This is a clean water valve cover. 20/Nov/2013 – S Staffs Water Co. say inspection confirms County Highways responsible & that they are aware. Silence from County Highways. 20/Nov/2013 – County Cllr Terry Finn (Lichfield City South), offers to get involved to resolve the impasse. 1-10/Dec/2013 – County Highways potholes repair team in the area; shove some tarmac in the hole. 12/Dec/2013 – S Staffs Water Co. confirm joint site inspection "next week" with County Highways. 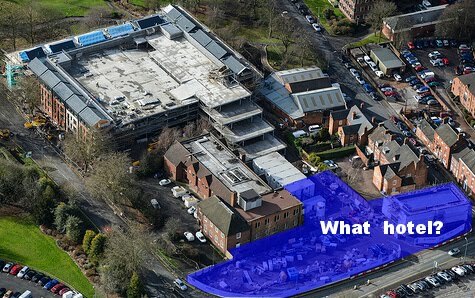 18/Nov/2013 – Angel Croft Hotel to be converted into apartments? Local residents have been concerned about the deterioration of the Angel Croft Hotel, which has been empty since 2008. This building should be brought back into use. So it is good news that a planning application has been submitted which proposes to do this. BSARA will comment on the detail of the application once we have reviewed the paperwork and discussed the proposal with the developer and the District Council. Webb Hotels and Travel Ltd own both the Angel Croft and George hotels. The owners, in partnership with Sammi Developments Ltd, now propose converting the Angel Croft to residential use. The planning application says the building will include nine apartments with sixteen parking spaces reserved for residents. A pay & display facility will continue on part of the site. The Angel Croft Hotel is in a conservation zone and is Grade II* listed, putting it among only 5.5% of listed buildings. In 2008 a planning application was submitted to refurbish the hotel, but was subsequently withdrawn. A person familiar with this planning application told BSARA that the cost of addressing conservation matters had made it uneconomic to proceed. BSARA understands that there have been repeated break-ins with metal thieves making off with lead flashing and with parts of the central heating system; which caused water damage. English Heritage have placed the building its front railings and gates on its Buildings at Risk register with an "A" priority, stating that there is an "immediate risk of further rapid deterioration or loss of fabric; no solution agreed". BSARA hopes that, on this occasion, the conservation issues which scuppered the 2008 planning application can be overcome. Flexibility on the part of the applicant and the District Council can preserve this important building and do so at a cost which is economically justifiable. BSARA wrote to Newcastle United Football Club protesting about the behaviour of a coachload of fans who, on 14/Sep/2013, stopped off in Beacon Street en-route to Aston Villa. The fans were obviously intoxicated, broke bottles, chanted and obstructed pedestrians and motorists. See photo on the right and a copy of our letter and the club's response below. We are pleased to say that Lichfield City Council, Lichfield Police and the football club were quick to say that this sort of behaviour is unacceptable. Inspector Rachel Joyce, of Lichfield Police, says that we can "be assured that enquries are still ongoing regarding the Newcastle fans and any offences that were committed", but asks that we "continue to be patient whilst these enquries continue". The football club say that the coach, see photo to the right, was independently hired by a group of supporters i.e. it was an unofficial supporters coach. BSARA have been assured that club sanctions will apply to any supporter arrested or charged as a direct result of their behaviour in Lichfield. Newcastle United have notified Northumbria Police of the incident and have encouraged them to work with Staffordshire Police and the Traffic Commissioner to take action against the offending coach operator. BSARA appreciates such a strong statement from the club. There is little more that can be done until the Police complete their investigation. Letter dated 07/Oct/2013 from Bob Smith (Chairman, BSARA) to Mike Ashley (Chairman, Newcaste United Football Club). Letter dated 14/Oct/2013 from Steve Storey (Head of Safety & Security, Newcaste United Football Club) to Bob Smith (Chairman, BSARA). LATE UPDATE [30/Aug]: For the second time in three months public and press have been excluded from a key Council scrutiny meeting. What is going wrong at Friary Outer? "Due to unforseen circumstances, the works, which were due to be completed by Friday 29/March/2013, have now been delayed, and the anticipated end date is now Wednesday 11/December/2013"
The District Council’s Friary Outer blog says “We post regular updates about the progress”, but the last update was in April, when no problems were noted. The aerial photographs below show good progress on the affordable housing and multi-storey car park, but not much sign of the hotel. Then on the 16/Jul/2013 a District Council Scrutiny Committee meeting was called to discuss progress on the Friary Outer & Friarsgate developments. The District Council decided that the public and the press should be excluded from the meeting “by reason of the confidential nature of the business to be transacted”. In Feb/2013 the District Council’s published its medium term financial strategy, which said that borrowings of £1,920,000 are required to finance the Friary Outer car park. If, as appears likely, there will be a delay to the Friarsgate shops, and the multi-story car park next to Debenhams is retained, then residents will have been saddled with a debt for a loss making car park built to service a hotel and a shopping centre, neither of which exist! We trust that the District Council will follow through on commitments given after the Heritage Parks upgrade fiasco, namely that in future it will do a better job informing the public. We thank Bromford Group for making photographs of the site available on their Flicker feed. photo: © Bromford Group. Used under Creative Commons Attribution 2.0 License. The Lichfield Bower is being held on the bank holiday, Monday 27th of May. There will be the Bower procession and the Bower Party in Beacon Park. Live music will be provided by ON STANDBY, a local band from Polesworth. There will be a BBQ with packington pork, chilli, black pudding hot dogs and hand made char grilled beef or minted lamb burgers. To entertain the kids there will be a free scavenger hunt and a few surprises if the weather holds up. Peter Rear, our former Chairman, used to refer to the George & Dragon as “the boardroom”, so this is a free plug for a local business and purveyor of fine ale. 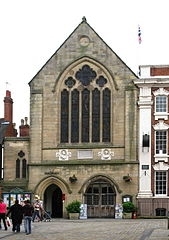 Annual Town Meeting for the Parish of Lichfield – Wednesday 22nd May 2013 at 7:30 p.m. in the Guild room, at the Guildhall. The meeting is empowered to discuss parish affairs and pass resolutions thereon. Any Local Government Elector for the parish of Lichfield is entitled to speak and vote at the meeting. Other members of the public may attend to hear the proceedings. CITY COUNCIL REPORT– To receive the Annual Report on the activities of the City Council. TO HEAR THE REQUESTS AND REPRESENTATIONS OF THE ELECTORS ON MATTERS WHICH AFFECT THE PARISH SPECIALLY – Under this item electors may discuss items affecting the parish especially, and may if they wish put forward motions for debate by the Meeting. PRESENTATION OF ANNUAL GRANT CHEQUES AWARDED BY THE CITY COUNCIL – The Mayor will formally present cheques to representatives of those organisations awarded grant aid from the City Council’s annual grants round. Photo: © David Rogers. Used under Creative Commons Attribution 2.0 License. On 18/Apr/2013 the Lichfield Alliance, which BSARA is a member of, wrote an open letter to all County Council election candidates standing in Lichfield District. The letter is attached at the foot of this web page. Have a look at the Lichfield Alliance web page for a list of the issues and the responses from Councillors. (a) Darwin Park – local roads have not been adopted 10+ years after construction. (b) Local trunk roads (A38 & A5) – The accident rate on the A38 near Lichfield is five times the national average for this type of road. (c) Bus station improvements are in limbo because of Friarsgate. (d) Lichfield City & Trent Valley Stations – Michael Fabricant MP said "Disabled access at Lichfield Trent Valley railway station is a disgrace". (f) Cycle lanes, public rights of way & hedgerows. Darwin Park – Check why the roads are unadopted and resolve the problem and in most new builds there is never enough parking or car spaces allowed for. City Centre congestion – The city centre needs more parking facilities or free transport electric style runaround vehicle that will move the public around the town centre avoiding the parking problem, picking up and dropping of in the available car parks, the congestion is caused by the haulage deliveries and private vehicle's stationary. Local trunk roads (A38 and A5) – A38 / A5 more speed restrictions or clearer speed limit signs also the mobile speed camera's more often. Bus station improvements – I don't use the bus service - so I would need information on the present problem, why the delay or funding. Lichfield Trent Valley Station – I know the T.V. Station is a problem as it's been mentioned to me before, not having a lift or easy access; I did write to British rail at the time but had no response, the above issues I can and would deal with depending on election results. Darwin Park – local roads that have not been adopted should be a matter taken up initially with the District Councillors for the Ward, i.e. Cllrs. Awty, Eadie and Smith. They can, of course, liaise with the newly elected County Councillor for Lichfield City South. As I am standing for Lichfield City North, I would not interfere with their endeavours but would want to be supportive in getting this resolved through work on both Councils. City Centre congestion – the District Council is at consultation stage with the Local Plan and has the legal jurisdiction to determine it. The County Council highway authority can “reserve judgment” up to the point where the District Council will make its determination (or else it will be determined without the highway authority registering comment). As I am only a prospective County Councillor at present, and subject to the rules of ‘purdah’, I cannot speak on the behalf County Council’s stance but would be keen to encourage comment, if elected. Local trunk roads (A38 and A5) – I support the use of speed cameras as the most effective means of controlling traffic on these major roads. They work very effectively on the section of A38 to the South of Lichfield. If elected to the County Council, I would want to support discussions with the appropriate authorities. Bus station improvements – It is correct to say we are in limbo because of Friarsgate. The District Council has given the developers a date this year by which a Friarsgate must be fully agreed and commissionable. If this is not forthcoming, the District Council will probably undertake a re-think on what is delivered in its place. I recognise the need for urgency in relation to transport improvements but the District Council has a legal process to follow with the developers, which it is following currently. Lichfield Trent Valley Station – You may see in my election literature I have identified disabled access at Lichfield Trent Valley as a priority for attention, if elected. I agree with Michael Fabricant MP in your quotation “Disabled access at Lichfield Trent Valley railway station is a disgrace”. Although it is just outside the Lichfield City North Division, a lot of my residents are users and I would want the County Council to play a role in securing the improvements needed. Cycle lanes, public rights of way & hedgerows – You cite a lack of coordinated action in these areas by the County Highways dept. If I am elected, I would use my authority to address these matters as I believe I have the reputation to take issues on and seek resolution. Thank you for your letter detailing the concerns of the Lichfield Alliance. I believe that residents associations have an important part to play in local government and look forward to working with you if elected. I was instrumental in the creation of LARA and have maintained excellent relations both with them, and BSARA, within my own ward. Darwin Park – Both the District and County Councils have dragged their heels in a disgraceful fashion with regard to the adoption of the highways and public open spaces on Darwin Park. In particular the highways need to be adopted so that proper traffic controlling measures can be taken to resolve issues of speeding and inconsiderate parking. City Centre congestion – For as long as I can remember, County Highways have just wrung their hands about traffic congestion in the City Centre. They have consistently failed to accept the effect that continued development, both retail (Tesco’s; Friarsgate) and residential, is having on traffic levels and without their support, District Planners and Councilors have been unable to prevent them happening. introduction of a traffic management scheme similar to the M42 between Lichfield and Burton. Bus station improvements – I agree that Friarsgate is a non starter and that alternative funding is needed to update the existing Bus Station. I would prefer to see the development of the Bird Street site bought forward. This would help rebalance the City centre and revitalise Market Street. Lichfield Trent Valley Station – I agree that provision for access and car parking at this station is a disgrace. Whilst the County Council can push for improved facilities at this station, it is up to London Midland and Network Rail to resolve the problems. As secretary of the Lichfield Rail Promotion Group this is something that I have been very active in for some months. 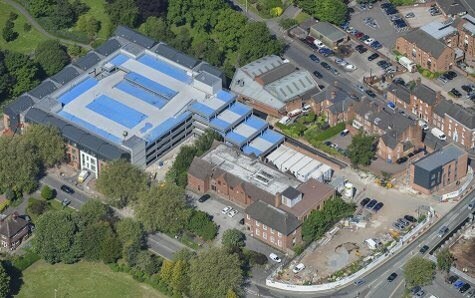 The car parking provision should virtually double this summer from 116 spaces to 228 when the additional spaces in the “triangle” off Old Burton Road are made available. This will also provide easier access to the up (London bound) platform although London Midland are still talking to Network Rail about making this access step free. This will improve the parking provision, but I suspect that further suppressed demand will mean that more will very soon be needed. There is a proposal to provide parking across the road on the old freight depot as part of the Streethay development, but this is in my view in the wrong place and the Streethay development itself has been thrown into question by HS2. The old GKN site would be far more appropriate, but the land owners seem to have an overly optimistic view of its value, despite that fact that the site has been empty for years. As far as access is concerned at Lichfield Trent Valley, I have had discussions in the last few months with Network Rail, London Midland, The Department of Transport, Staffs County Council and even Norman Baker, the Minister at the Dft responsible for accessibility. There is new funding (£100m) being made available next year as part of the Access for All scheme, and we are all trying to ensure that some of this cash comes to Lichfield. The increased footfall at Trent Valley, as well as it’s growing importance as an interchange station and the fact that it is the nearest access point for the NMA, all give some hope that we will succeed, although £100m does not go very far on railway infrastructure and the competion for these funds is fierce. Cycle lanes, public rights of way & hedgerows – Public rights of way and Hedgerows. It is inevitable that these areas will suffer when the County Council cannot even afford to maintain the roads properly. My answer would be to use the provisions and principles of the Localism Act to devolve these responsibilities to Parish councils. Lichfield City already carries out the maintenance of most of the footpaths in the City and this principle could be extended. The Local Plan process at the moment is a complete shambles. I agree that it needed major reform but this should be a carefully considered process. Eric Pickles has scrapped the existing systems without giving any, let alone adequate, thought to what would be put in its place. As the only candidate for this Division who actually lives in it, I look forward to the opportunity to represent my neighbours in Stafford. Thank you for your letter with regard to the above. I’m sorry I have not replied to you sooner but I have been spending all my time on the election and what for me is the most important thing, getting out to meet the people and hearing what their concerns and grievances are. As you will know I can do nothing if not elected. If I am the Councillor for Lichfield North on Friday evening then I will look into all the matters you raise in your letter. Local trunk roads (A38 and A5) – I agree the accident rate on the local trunk roads (A38 & A5) is not acceptable and should be addressed as a matter of urgency. Bus station improvements –Bus transport is certainly an issue. Passengers now have to change buses at Sutton if going to Birmingham and, as I understand it pay twice for a service which has been reduced from hourly to two hourly. Hardly an incentive to get people out of their cars! Lichfield Trent Valley Station – I agree it is a disgrace that in 2013 we have a main line station or any station that is not accessible to all. Cycle lanes, public rights of way & hedgerows – As a keen walker I have been instrumental is getting stiles and bridges repaired, footpaths opened where farmers have obstructed paths within the county. I also take a great interest in cycle lanes and the opportunity for safe cycling. I will continue to do so whatever the outcome of Thursday’s election but I do believe the council should continue to take responsibility and manage the repairs accordingly. Whilst out meeting residents in Lichfield North I have come across many issues with regard to housing and transport, all of which I take seriously and will work to address if elected..
Darwin Park –The adoption process is coming to a conclusion ( at long last ) The lighting inspections and remedials are to be speeded up by the contractor and EON. County lighting engineers closely monitoring the situation. Lichfield Trent Valley Station – I have always supported our MP Michael Fabricant make the access to all platforms available for people with any disability . I am in support of the proposed new car park on the northern side of the station. Cycle lanes, public rights of way & hedgerows – Further monies to support these important means of travel are needed . Having in the past served on this county committee I am fully aware how difficult it is to get the farming community to cooperate even when placed under pressure to comply with legislation . I am aware of the future county plans to improve on the last four years work which was spent on 28 years of near neglect. The proposed improvements to the roads including completion of the Lichfield Southern Bypass and improved parking at Lichfield Trent Valley station are most necessary. The proposed Friarsgate retail development should be revisited and potentially halted. How viable is a large new retail / leisure development in the current climate - especially with so much vacant retail space in Lichfield. Also the latest plans for this development no longer include the proposed hotel and as a result space for more shops! There is a real need to increase employment in the Lichfield area and so reduce the amount of commuting out of Lichfield. Affordable housing must be a key priority. Many people find housing very expensive to afford in Lichfield and its surrounding area and we must ensure that sufficient affordable homes are built as part of new developments.